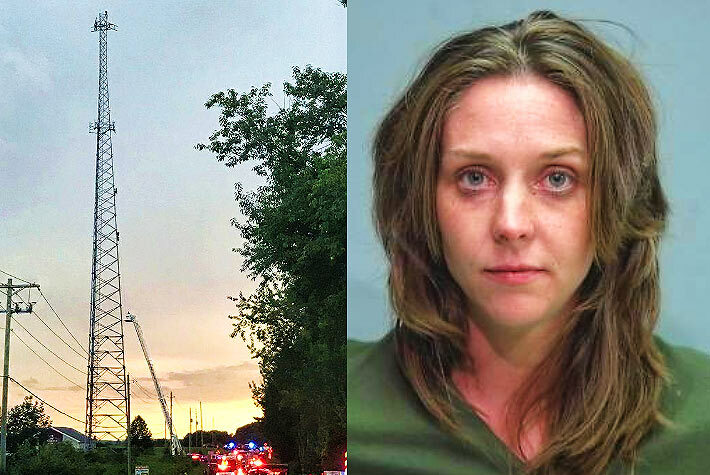 A 29-year-old woman was arrested Thursday night after she climbed to the top of a 300-foot SBA Communications self-supporting tower in Wooster, Ohio, and refused to come down, taunting police and emergency personnel as she traversed diagonals in flip-flops. After a three-hour standoff that drew dozens of rescue workers and hundreds of spectators, Jessica Lee McCarty descended the tower on her own and was arrested at 9:15 p.m.
McCarty pleaded guilty Friday morning before a Wayne County Municipal Court magistrate to misdemeanor charges of inducing panic, disorderly conduct and criminal trespass, and was out on bail with a recognizance bond. Police said McCarty stated that she entered the tower compound by shimmying through the locked gate. 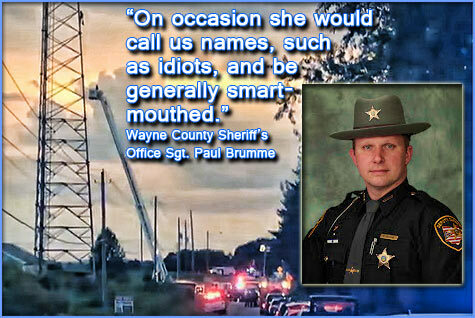 “On occasion, she would call us names, such as idiots, and be generally smart-mouthed as we were trying to get some cooperation from her,” Wayne County Sheriff’s Office Sgt. Paul Brumme wrote in the arrest affidavit. McCarty’s climb received more media attention than a man who earlier in the morning in Springfield, Ore. climbed a monopole to the 100-foot level and refused to come down for an hour. Police believe the man was under the influence of methamphetamine and was airing a grievance against the Springfield Police Department for impounding his car. To pirate the popular Farmers Insurance phrase, We know a thing or two because we’ve seen a thing or two, Wireless Estimator, covering the tower beat since 2004, knows the man’s comment was not accurate. In 2012, a 45-year-old man, not wearing flip-flops, shoes, socks or any other apparel, climbed naked up a 228-foot Los Angeles tower and it took six hours for authorities to get him down (see article below). But the mother of all tower climber rescues (also below) began on Aug. 11, 2011, when a 25-year-old mentally challenged man climbed a Tulsa, Okla. 300-foot tower and refused to come down, and he didn’t, for six full days, five of them without food and water. 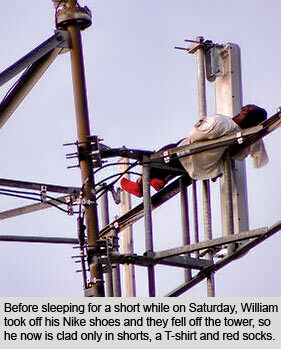 Wireless Estimator’s audience stayed riveted to the rescue when the site provided extensive coverage and frequent updates about William Sturdivant’s days walking and sleeping on a Verizon t-arm. The event was of interest internationally as Sturdivant, who became known as the infamous ‘Tower Guy,’ was finally safely brought down from his perch. Sturdivant, who has schizophrenia, reportedly was not taking his medicine and later said he didn’t remember too much of the incident. In McCarty’s climbing episode, it is not known why she went on her three-hour criminal cardio climb. However, Wayne County Sheriff’s Capt. Doug Hunter said he believes he might have the answer, the reverse of Sturdivant; she could have been taking too many medicines or drugs. “…I believe she’s under the influence of drugs of some type because she demonstrates absolutely no fear at all,” Hunter told The Daily Record on Thursday. On Friday, in the Sherrif’s Office’s daily video update, Hunter requested that the media should consider not publishing the name of the climber since, it would give her the attention that she craved. McCarty was neither charged with being under the influence nor drug possession. According to the affidavit, McCarty requested that she would like a male friend of hers to come to the scene to bring her water and a cigarette. To get Sturdivant to come down, authorities offered him cigarettes. And because we know a thing or two, in June of 2012, cigarettes also played a role in getting an Arkansas man to come down off a tower after a six-hour standoff with police in Benton County, Ark. Police say Ronald Jeff Grigg was sitting on top of the tower with five guns, but either because he was intoxicated, clumsy, or afraid of heights, he began to drop most of them accidently. Then while trying to light a cigarette, he dropped his lighter. His uncontrolled craving for a cigarette got the best of him and he came down. 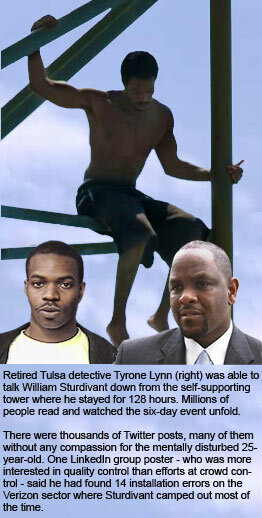 Update: August 17, 2011, 7:00 a.m. – After unsuccessful attempts by numerous negotiators, retired Tulsa police detective Tyrone Lynn successfully talked William Sturdivant off the Clear Channel tower yesterday evening where Sturdivant resided for almost six days, five of them without food and water. Sturdivant off the Clear Channel tower yesterday evening where Sturdivant resided for almost six days, five of them without food and water. Sturdivant was lowered in the Tulsa Fire Department’s ladder truck’s bucket after Lynn’s seven hours of conversations with Sturdivant gained the man’s trust. Lynn told reporters that his main strategy was patience. “Take my time and develop some rapport. And kind of keep things on his terms as much as possible,” Lynn said. He said he and Sturdivant talked about everything from their families to their faith and how Sturdivant could use his experiences to help others in similar situations. Throughout the final three-hour cat and mouse scene where Lynn would taunt Sturdivant by offering him scraps of food and throwing water at him as well as giving him access to bottles of water that were drained to only a drop or two, it appeared to observers that Lynn was using the tactic to lure the seriously dehydrated man into the bucket so that he could be restrained by the impressively large and fit officer. At one point it appeared that it worked as Lynn was seen trying to pull Sturdivant by his legs into the open door of the bucket on a live streaming video of the negotiations. However, the 25-year-old continued to hold a vise-like-grip on the angle iron. Oklahoman staff photographer Mike Simons also thought that Lynn tried to grab Sturdivant and a short tug of war ensued which Simons captured with his camera. Lynn says that wasn’t what happened, explaining that Sturdivant went into a convulsion and started shaking real bad. “He started to pass out and I grabbed him to keep him from falling. So for a minute there he just was completely out so I was just holding on to him. And then he just sort of snapped back into it and then we started over again,” Lynn told reporters after the successful rescue. Sturdivant quickly went from the edge of the bucket to the tower and took a cat-like defensive position on the bracing. He then pointed to Lynn and told him to take his bucket to the ground. Lynn, as he had previously done when Sturdivant became agitated, moved the bucket away and had the truck’s operator return him to the ground. Shortly thereafter, Lynn returned to Sturdivant’s perch and was able to talk him into the bucket and be lowered to the base of the tower to awaiting emergency services personnel at 6:40 p.m.
Once he is treated and has recovered, Sturdivant is expected to be transferred to a mental health facility for observation, according to Tulsa police. Lynn is back on the job this morning running a construction company, one that is far removed from working on a cell tower as he was yesterday. 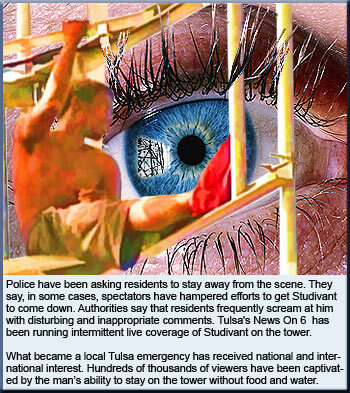 Update: August 16, 2011, 5:30 a.m. – “Tower Man,” only known as William for the past five days while he has been on a Tulsa 300-foot tower, has been identified as William Sturdivant. Police say he has a criminal record including burglary and drug convictions, and a history of mental illness. Even though he told negotiators he would jump if they attempted to approach him with any rescue apparatus, police do not believe that he is suicidal. Officers were playing recordings from his family early this morning, asking him to come down. Even though he was standing on a tower mount at 5:30 a.m., they say he is showing serious signs of weakness and is starting to lose his balance as he moves slowly on the structure. Heat stroke or dehydration could cause muscle cramping, even kidney failure. It can affect the brain directly and cause him to lose control of his body or simply pass out. The lack of food and water will cause Sturdivant’s body to slowly shut down, one system and organ at a time and suffer fatal heart arrhythmias, doctors say. On Monday evening he removed his bright red socks and was lowering himself on the tower on a tower leg that did not have step bolts. Although he appeared to want to climb back to bracing he had previously been on, something he’s done dozens of times over the past five days, it appeared that he did not have the energy to pull himself back up. Later in the morning he seemed to gain strength and was able to climb back to the Verizon tower mount where he was hanging on to an antenna. Negotiators say Sturdivant has exhibited bizarre behavior in the past, including walking all the way from Tulsa to Dallas. Last month, he stood on a bridge in Missouri for hours. Police were asking residents to stay away from the scene. They say, in some cases, spectators have hampered efforts to get him to come down. Temperatures could reach 100 degrees today with the possibility of noontime thunderstorms. Update: August 15, 2011, 9:00 a.m. – Police have been talking to William for about two hours this morning. They have the fire department’s ladder and bucket near his position on the Verizon antenna mount, but he has made no attempt to get in it. In another two hours, he will be going into his fifth day on the tower without food. He hasn’t had water since Thursday. 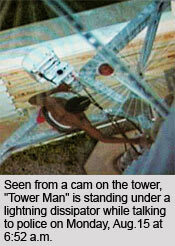 August 14, 2011 – A 25-year-old mentally challenged man was still taunting police at 12:30 p.m. after refusing to come down from a 300-foot Clear Channel Communications tower in Tulsa, Okla. where he has been perched since 11:00 a.m. Thursday. Police have identified the man only as William, but throughout the community and media, he has been given the moniker “Tower Man”. Offering him food, cigarettes and counseling help if he will make his way down the tower, with or without assistance, police continued to negotiate overnight. This morning authorities said he looked more drawn and was considerably dehydrated. Today’s temperatures are expected to rise to the mid-90s. A tactical squad officer climbed the tower on Thursday and provided William with water and a cell phone. However, the battery died later in the day and police negotiators have been communicating since then by hollering back and forth. He welcomed this morning’s sunrise by crowing like a rooster and requesting a hamburger. He denies that he plans to commit suicide. “There’s no such thing as suicide,” he said. “I don’t listen to that negativity, that flimflam stuff,” William could be heard to say as police tried to explain that he is putting himself in danger. He has been observed taking cat naps cradled on Verizon’s cell antenna mounts. The carrier has deactivated their antennae during the crisis. Before sleeping for a short while on Saturday, William took off his Nike shoes and they fell off the tower, so he now is clad only in shorts, a T-shirt and red socks. The police officer remains confident the man will come down and it’s just a matter of when. However, at about 5:20 a.m. on Friday, police took more aggressive action by firing pepper balls, or powdered pepper spray, at William. Firefighters used a ladder truck to raise a basket to William to coax him into it multiple times on Friday, but he wouldn’t get into it to be lowered to the ground. As he continued to shuffle around the tower Friday night, rain began falling again as another thunderstorm moved into Tulsa. He withstood 60 mph winds but was starting to act tired, police said. The tower is located at 27th St. and Memorial Dr.
William had been seen on Wednesday on the top of a building at the site, but was chased away. An employee of Fox23 News whose studios are at the tower site said that William might have been sneaking into the building somehow and sleeping in the basement, allowing him access to the self-supporting tower’s step bolts. Towers are oftentimes the vehicle of choice for a number of people who use them to commit suicide. They’re also used by some to gain attention such as the case where a woman in India threatened to jump if her parents made her go through an arranged marriage. Last April, Usha Bala, 22, held authorities at bay at the 60-foot level of a cell tower as more than 500 people watched for an hour. She requested police to call her grandfather on his cellphone. After her grandfather assured her that nobody in the family will get her married against her will, she came down. Joseph Anthony Pidgeon told a police officer that he scaled the tower “because it was there,” a quotation attributed to George Mallory on why he climbed Mount Everest. February 9, 2012 – A tower climber ascended a 228-foot communications tower in downtown Los Angeles yesterday without a safety harness as well as no shoes, socks or any other apparel. The au naturel man, a 45-year-old Arizona resident, came down from his perch after police fulfilled his request for a late night dinner of two hamburgers from McDonald’s. Firefighters from the Los Angeles Fire Department set up air cushions to catch the man in case he fell following his 4 p.m. climb, police said. The man was wrapped in a blanket, lowered to the ground in a basket by a makeshift pulley system and taken into custody at approximately 10 p.m. It was not yet clear what prompted the emotionally unstable man to scale the tower and maintain a standoff with police for six hours. The man will not face criminal charges for his actions, according to police. In June, an Arkansas man also had a six-hour standoff with police in Benton County, but was enticed to come down after an uncontrollable craving for a cigarette. Police say Ronald Jeff Grigg was sitting on top of the tower with five guns, but either because he was intoxicated, clumsy, or afraid of heights, he began to accidentally drop most of them. Then while trying to light a cigarette he dropped his lighter. Communications towers have also become a magnet for a number of people committing suicide. Alori Joh, an emerging 25-year-old singer on the hip-hop scene leapt to her death on Monday from a broadcast tower in unincorporated Rancho Dominguez near Compton, Calif.
On January 31, a body found in Richland Hills, Tex. was the result of a suicide of a man in his 20s jumping from a tower, officials said. Tower technicians were at the tower to perform routine maintenance when they found a hole in the roof of an equipment building and a body on the floor. There was no word on how long the body may have been there.